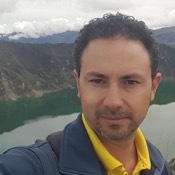 Traveler Review for Private Tour in Quito, Ecuador by Tour Guide Juan Pablo L.
Tour: Baños Private full day tour. About Juan Pablo L. Message Juan Pablo L.
Baños Private full day tour. The house of the tree and the swing of the end of the world. The tour was amazing.... we have a great time with Juan Pablo... he gave us a lot of information of the city and wonderful recommendations about the xtrem sports at Baños. The road trip was confortable and with a very nice sightseeing. We truly recommended Juan Pablo as a tour guide and the unbelievable Baños tour. TOUR GUIDE RESPONSE: Thanks for the review, it was really nice tour, I glad that you enjoy the tour. Best wishes.